Welcome to Gemtech's Technical support page. Here you will find the most frequently asked questions received from our customer, answered based on our experience learned over the past few decades and making tens of thousands of suppressors. The questions are divided into various topics to help narrow down your search. If you are new to suppressors think of this as a bit of "Suppressors 101." If you need the technical manual for your suppressor, please visit the suppressor product page or for some of our earlier suppressors click HERE. If your question cannot be answered by the FAQ's listed here, or on the an individual product page, please contact us. Are suppressors legal to own? Yes! Suppressors are legal for ownership by private citizens in most states. Please see our MAP for more informaiton. If you are a RESIDENT of one of the states listed on the map you may purchase a silencer through a licensed dealer in your home state. If you OWN a second home in one of the states listed above, you may be considered a part-time resident of that state while residing in your second home and you may be able to purchase a suppressor from a dealer in that state. Contact a dealer for additional details. For a listing of Gemtech dealers please Click Here. If you live in a state that is not listed above, there is no legal way for you to purchase a suppressor at all. Please don't ask us to break Federal law. No, you can't go to a legal state to make the purchase. No, you can't have a friend, or family member in another state make the purchase for you. YOU must purchase the suppressor from a dealer in your state of RESIDENCE. Dealers & Manufacturers ONLY: CA, IA, MA and NY. Law Enforcement Agencies: Please contact Gemtech directly for information on purchasing suppressors for your agency use. Do I need a license to buy or own a suppressor? No, a license is only required if you are a dealer or manufacturer. However, there is a registration process that is required for purchase (see next question). Step 1: Decide which suppressor you would like to purchase and contact a dealer in your area. Step 2: The dealer will order the suppressor from Gemtech (unless they already have it in stock). Gemtech must complete some transfer paperwork with the Bureau of Alcohol, Tobacco, Firearms & Explosives (BATFE) to receive permission to transfer the suppressor to your dealer. This process usually takes about 4-5 weeks, but can take longer in some cases. b) One copy of this form must be sent in to your local Sheriff or Police Chief. 4. If you are purchasing as a Corporation, LLC, or Trust, include copies of your articles of incorporation or trust paperwork. Step 5: Wait... The BATFE background check and transfer process will take about 10 months to complete. It seems like a really long time. But it will be well worth it once you are quietly shooting at the range or in your backyard (where legal). Where can I download the necessary forms? The required transfer paperwork is available from the BATFE on their website. However, your dealer will usually supply you with the necessary forms. Fingerprint cards are usually obtained from your local law enforcement agency when they fingerprint you. Should I fill out the paperwork now to get a head start? Contact your dealer first. In some cases, you can get started on some of the paperwork immediately to reduce processing time. However, the paperwork cannot be sent to BATFE until a specific serial number has been provided by Gemtech, and the dealer actually receives the suppressor from Gemtech. Can Gemtech provide me with a serial number to put on my paperwork? No. We cannot provide suppressor serial numbers to you. Gemtech receives many orders, from many dealers. We rarely are provided with the name of the customer by the dealer when the order is placed. We have no way of knowing if the serial number we have assigned to a dealer is your specific suppressor or not. Contact your dealer for serial number information. What is the $200 Transfer tax about? The short story is: Since 1934, the US Government has required a $200 transfer tax to be paid on any machine gun, short barrel rifle, short barrel shotgun, destructive device, and silencer. The tax was instituted by Congress essentially as a de facto ban on NFA Firearms. It was their hope that such a prohibitively expensive tax on such weapons would make them unobtainable for the average person. They also did not want to outright ban such weapons and cause bloodshed in an attempt to confiscate such weapons from their owners (hence the requirement for registration). As the tax has never been adjusted to keep pace with inflation, it is now more of a "nuisance tax" than a real barrier to owning NFA weapons. Yes, unfortunately you have to pay it... no two ways about it. Everyone you've ever met that has a silencer has paid it. As we say, "You've gotta pay to play!" And just remember, $200 was a whole lot more back in 1934. What is a Chief Law Enforcement Officer (CLEO) Notification? As of July 13th, 2016, the CLEO sign off has become a CLEO notification. The new Form 4 has an extra copy that is sent in to your local CLEO to notify them of the sale. Prior to July 13th, 2016, it was required to have your Form 4 signed by a local Chief Law Enforcement Officer. When the National Firearms Act was enacted in 1934, there was no National Instant Criminal Background Check System (NICS), etc. So, when transferring an NFA item, it required the Chief Law Enforcement Officer of the applicants jurisdiction to certify that he (or she) was not the town bad-guy or town drunk. This was a legacy policy that was left-over within the BATFE's requirements to purchase an NFA Firearm. What is the procedure to purchase as a Corporation or Trust? Currently, the BATFE will allow registration of NFA firearms to a corporation (including non-profit, or LLC), as well as trusts (used for estate planning). Gemtech recommends contacting a qualified attorney to advise you on legal requirements and ramifications of forming a corporation or trust in your state. For many, this is a way to legally own NFA firearms in some areas. Can I purchase a suppressor directly from Gemtech? Gemtech will only sell suppressors to licensed dealers who have submitted a copy of their Federal Firearms License (FFL) to Gemtech, or directly to government agencies (not individual officers). Dealers must also submit a copy of their Special Occupation Taxpayer (SOT) certificate to buy from us Transfer Tax Exempt. Can I purchase accessories directly from Gemtech? You're here at our webstore! Any page here where you can click "ADD TO GEAR" is a non-firearm accessory we may ship directly to you. Any product that says "Find a Dealer" can only be purchased by: A Government agency, an FFL dealer in a state legal to own them, or you have to order it through a dealer in your home state (see above). I am Law Enforcement / Military. Can I purchase direct from Gemtech? Gemtech can sell directly to Law Enforcement Agencies and Military units for official purchases. These are done on a Tax Exempt Form 5 and the suppressors are the property of the agency or the US Government. For price quotes and information please contact Gemtech directly. If you are a law enforcement officer or in the military and you would like to purchase a suppressor personally, even for official duty use, it must be done as an individual, tax paid, and through a dealer in your state of residence. Does Gemtech offer a Law Enforcement / Military Discount? Gemtech extends a 10% discount on parts and accessories to Law Enforcement and Active Duty Military. In order to get this discount, you MUST register an account on our website FIRST and then contact us to have your account type changed BEFORE placing your order. Verification of status is done by either a fax or e-mailed copy of your credentials or simply registering your account using your department or .mil address. Unfortunately, because suppressors must be sold through a Class III dealer in your state of residence, we do not set the final selling price of the suppressor -- so we are unable to extend a discount. You will need to check with your dealer to see if they offer any discounts to law enforcement and military customers. Do NOT place your order until receiving verification from Gemtech that your account type has been updated to reflect your LE/MIL status. Orders cannot be retroactively discounted after an order is placed. Silencer or Suppressor? What's the difference? The terms "silencer" and "suppressor" are both correct. Most people within the industry prefer the term "suppressor" because it is more technically correct in that a suppressor does not actually silence a firearm but suppresses the noise some amount. That said, the legal term as used by BATFE to classify these weapons is "silencer". You may also hear people refer to suppressors by the slang term "cans". A suppressor works in much the same way as the muffler on a gas combustion engine. In fact, both were developed around the same time by Hiram Maxim. The primary function is to cool and slow the escape of hot, high pressure, combustion gasses into the surrounding atmosphere. As a practical example of how this works, imagine two inflated balloons. If you were to pop one of the balloons with a pin, the air inside would rapidly expand into the surrounding, lower pressure air over a very short time period. The result would be a loud pop. Take the second balloon and simply release the neck. It will putter around through the air as the higher pressure air inside slowly escapes through the neck into the lower pressure surrounding air making much less noise. First Round Pop is a phenomenon in which the first round fired through a cold suppressor is louder than the subsequent shots fired. This is caused by the combustion of oxygen within the suppressor. After the first round is fired, the oxygen is burned up and replaced by combustion gasses. If the suppressor is allowed to cool for a short period of time (minutes) the FRP will occur again. Some suppressor designs are very effective at reducing or eliminating FRP. How does a suppressor mount to my gun? Most all modern suppressors mount to the host weapon by threading onto the barrel. In some cases, suppressors mount to the host weapon with some type of quick-detach device. Usually this quick-detach adapter will require a threaded barrel to mount to the host weapon. Gemtech can thread most rifle barrels if they are not already threaded. We can also direct you to a source for extended, threaded pistol barrels for most popular handguns (additional info in our Pistol FAQ section). GEMTECH suppressors are made of premium materials so are very strong and will last an extremely long time. There are very few, if any, moving parts to wear out. In most cases a suppressor will outlast the barrel life of the host firearm. We have examples of centerfire rifle suppressors that have had over 100,000 rounds fired through them. We have examples of submachine gun suppressors with over 200,000 rounds fired through them. Some older suppressors utilized a series of rubber, urethane, or leather disks called "wipes" to trap gas within the suppressor as the bullet passed through. These needed to be replaced after only a handful of rounds were fired. With the exception of a few very specialized suppressors, modern suppressors do not use "wipes". Instead, we use precision machined baffle stacks made from various metals for long life. Does Gemtech make any shotgun suppressors? No. And please return that "No Country For Old Men" DVD to Netflix. Shotgun suppressors are sometimes found in Europe but most designs are large, crude, and heavy. While there are some sources in the United States for shotgun suppressors, they are generally not very effective for their large size. The very large bore size and issues involved in dealing with the multiple shot pellets within the projectile and the instability of the shotgun wad make shotgun suppressors somewhat impractical. What is the minimum barrel length I can use with my suppressor? I have a "Brand X" AR-15 type rifle. Do you make a suppressor for it? Yes. We make many different suppressor models that will fit almost any brand of AR-15. Most AR-15 type rifles use a standard mil-spec thread on the end of the barrel to attach flash hiders and suppressors so our suppressors should fit your rifle, regardless of brand. Certain barrel profiles (heavy barrels) or lengths (very short barrels) may require special mounts or specific models of suppress to fit properly. If the barrel of your AR-15 is not threaded it will need to be threaded so that a suppressor or suppressor adapter can be attached. We offer that service in our Custom Shop. You have several different models of 5.56mm suppressors. Which one should I buy? We offer multiple suppressors for the 5.56mm family of weapons. The primary difference between them is the way in which they mount to the host weapon and the materials used in their construction. The right suppressor choice for you is based on the mount style you prefer as well as how much you would like to spend. The TREK is a simple, durable, thread mount design. As our shortest and quietest 5.56mm threadmounting suppressor it is ideal as an "always on" suppressor on compact rifles where overall system length is a prime consideration. The TREK is an affordable suppressor for law enforcement agencies that want to purchase multiple suppressors on a limited budget. The TREK can also be used for .22LR, .17HMR, and other intermediate calibers such as 5.7x28mm, .22 Hornet and .22-250, etc. The TREK features 100% welded construction and is rated for full-auto fire on 5.56mm rifles with barrels at least 10.4" in length. The PATROLMAN is identical to the TREK in dimensions and design but is built from high strength Inconel and titanium alloys. It is the shortest, quietest, and lightest 5.56mm threadmounting suppressor that Gemtech offers with full-auto capability. It is an extremely light weight and compact package adding just over 4" in length to the host rifle (when compared to a traditional flash hider) and just over 12 ounces in weight - about the same as most handgun suppressors! The PATROLMAN is rated for full-auto fire on 5.56mm rifles with barrels at least 10.3" in length. The GMT-HALO is a robust, universal mounting suppressor made of high strength Inconel and titanium alloys. Designed to mount to a NATO standard flash hider via the BFA groove, it can be used on the A1 and A2 flash hiders of the AR-15 / M16 family of rifles as well as the M249 SAW, HK, FN, Ruger®, and many other rifles. The patented universal mounting system provides a secure means of attachment to a number of rifles without the added expense of special flash hider mounts for each host weapon. Sold primarily to the US Military and friendly foreign nations, the HALO is extremely popular because it does not require any modification to the host weapon to be able to mount it. Therefore it can be shared between several operators as needed. The GMT-HALO is rated for full-auto fire within the limitations of the ammunition and host firearm and should be used on 5.56mm weapons with barrels at least 10.4" in length. The 2010 models of HALO (identified from earlier models by a rear closer that has an aggressive "golfball" griptexture and four internal alignment teeth that can be seen down inside the female mount) also fit the Smith Enterprises VORTEX flash hiders, which also adds the benefit of four indexable locking points. The G5 is a true quick connect, quick disconnect suppressor. The G5 is the premier Gemtech 5.56mm suppressor. It utilizes an improved Quickmount system for secure, repeatable installation on the host weapon. While shorter, and lighter than the HALO it provides equal or slightly better sound reduction. The G5 has no levers, gates or locking rings to rotate or tighten during mounting so there is nothing to come loose during extended firing. The G5 mounts with a gross motor movement that can be done in complete darkness, under stress, and the operator is assured that the suppressor is securely locked in place. In use by all branches of the US Military; Federal, State, and local Law Enforcement; as well as the militaries of 8 foreign nations; the G5 has been issued a US National Stock Number (NSN). The G5 is also rated for full-auto use on 5.56mm rifles with barrels at least 10.4" in length. The G5 has been discontinued as of 2014. The SHIELD is identical in dimension and performance to the original G5, but with a lighter, high strength titanium and Inconel construction. The SHIELD uses the same flash hider adapters for mounting as the standard G5. The SHIELD is rated for full-auto use on 5.56mm rifles with barrels at least 10.4" in length. All of our 5.56mm suppressors are considered hearing safe by OSHA standards. Ruger® and Mini-14® are registered trademarks of Sturm, Ruger & Co., Inc.
You have several different models of 7.62mm suppressors. What is the difference? That's all there is to it. The baffle design is the same in all four models and the performance will be very similar so all you have to decide is what material you want (or how much you want to spend) and what type of mount you want - traditional threads or quick detach. What types of flash hiders/brakes will the HALO fit? The HALO is designed to fit any NATO Standard flash hider/brake. This includes the USGI A1 and A2 birdcage flash hiders, as well as the M249 SAW, HK, FN FNC, and others. It will also fit the Primary Weapons SM556 brake, VLTOR VC1 flash hider, and new for 2010, the Smith Vortex flash hider. HALOs made prior to 2010 (Serial number will start with an "S09-" or earlier date code.) will NOT fit the Vortex style flash hiders, but will fit the PWS FSC556 compensator. Newer HALOs with "S10-" prefixes on, should fit the SM556, but not the earlier PWS FSC. Can I use a .308/7.62mm suppressor on other calibers? Yes, many of our customers use our HVT suppressors on smaller caliber weapons such as 7.62x39mm, 6.8mm SPC, 6.5 Grendel, .270 Win, and even 5.56mm. So long as the bullet diameter is 7.62mm or less, and the pressure is equal or less than that of a 30-06 our 7.62mm suppressors can be used. For use on 5.56mm, the HVT and Quicksand with Quickmount system will fit onto the same flash hider mounts used by the G5, which are available in common thread pitches to fit almost any 5.56mm rifle. Can I shoot .22-250 through a 5.56mm suppressor? Yes, provided the .22-250 is 22" or longer. We have a number of customers that use our 5.56mm suppressor on .22-250 rifles. Can I shoot .22LR or other rimfire calibers through my 5.56mm suppressor? Yes, any of our 5.56mm suppressor can be used on .22LR weapons, including AR-15 type rifles using Ceiner or other brand conversion kits. Can/Should a rifle suppressor be shot "wet"? No. A centerfire rifle suppressor should never be shot "wet". Using liquid inside the suppressor reduces the available volume for gas expansion. This increases the pressure and could cause the suppressor to bulge or burst which could injure or kill the shooter or bystanders. Centerfire rifle suppressors have much higher internal pressures than rimfire or pistol caliber suppressors. If the suppressor becomes submerged, allow the unit to fully drain before shooting. If needed for clandestine lab or in explosive gas environments in law enforcement or military use, a small amount (1 tsp) of water may be put into the suppressor to squelch spark or flame. Use coolant sparingly and cautiously, reference the warnings above about overpressure. What ammunition do you recommend for best performance? Gemtech suppressors are tested using Milspec and/or SAAMI spec ammunition. We recommend the use of Milspec or SAAMI spec ammunition at all times. As with most firearms manufacturers, we do not warranty our suppressors when used with handloaded ammunition. There are simply too many variables outside of our control when using handloads. Additional information regarding ammunition recommendations is listed in the AMMUNITION section of our FAQ. Do you make a suppressor for 6.8mm SPC, 6.5 Grendel, .270 Win, etc.? We do not offer a suppressor specifically for those calibers, however, many of our customers are using our 7.62mm/.30 cal suppressors on these intermediate calibers with excellent results. Are your 7.62mm suppressors rated for use with .300 Win. Mag. or .300 WSM? The HVT series, SANDSTORM, and QUICKSAND can not be used on .300 Win Mag or .300 WSM. The ONE, DAGGER, and TRACKER suppressors are rated for up to and including .300 Win Mag. I have a non-AR-15 rifle in .223/5.56mm, will your suppressors fit? As you can see, the G5 and SHIELD are the most adaptable, but will require a special flash hider for each rifle. The HALO will fit some of the rifles listed above that use NATO Standard flash hiders, and our thread mount units will only fit those rifles that use standard 1/2-28 threads to mount their existing flash hiders. What AR15 rails will your suppressors fit under? The HALO, G5, G5-T, TREK, TREK-T, SHIELD, and PATROLMAN are all 1.5" in diameter and will fit under any free float rail system that has at least 1.5" of inside diameter clearance. However, the HALO may be difficult to use because of the need to tighten the collar behind the flash hider. The M4-02 is 1.375" and will fit under some rail systems that the larger suppressors will not. Contact the manufacturer of the rail you are interested in and ask them for the inside dimension of their rail. Do I need to shoot subsonic ammo with my suppressor? 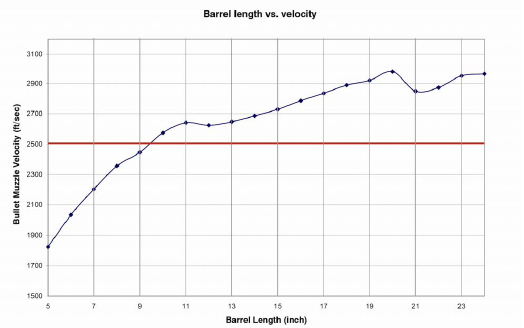 What is the minimum barrel length recommendation? Stability: The standard 1:7 twist rate of 5.56mm barrels barely provides one full turn in the rifling before releasing the bullet when using a 7" or 7.5" barrel. This does not impart enough spin on the projectile to properly stabilize it during the critical first few inches of flight as it passes through the suppressor. While the bullet may stabilize downrange suitably to be accurate when shooting unsuppressed, it will not stabilize and will strike baffles when a suppressor is mounted. Some barrels use a 1:8 or 1:9 twist making the problem even worse. Velocity: The 5.56mm cartridge is also very velocity dependent for stability. Very short barrels, less than 10.3" do not allow sufficient velocity to properly stabilize the round, thereby exacerbating the stability problem described above. Erosion: The 5.56mm cartridge was designed to burn its powder in a 20" service rifle (M16A1, M16A2). The maximum flame temperature and pressure happen at around 7" from the chamber. Short barrels under 10.3" cause excessive flame temperature and pressure within the entrance chamber of the suppressor. This causes excessive erosion of the blast baffle because hot, high pressure particles of unburnt powder sandblast this baffle. So, provided you are lucky enough to avoid a baffle strike due the above two issues, the suppressor will be worn out in a very short period of time due to erosion. Pressure: As the barrel length is reduced, the pressure within the suppressor increases. A 10.3" barrel is the minimum barrel length that we require to maintain an adequate safety factor and prevent any damage to the suppressor or injury to the user. Although a few inches of barrel doesn't seem like it would make much difference, it really does. 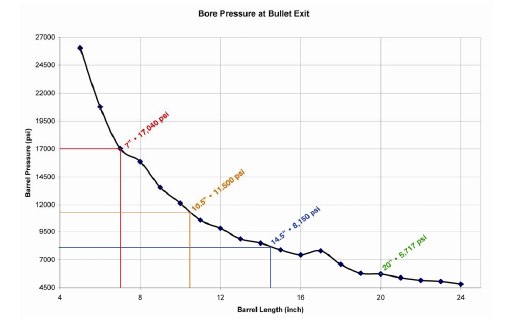 The uncorking pressure at the muzzle of a 7" barrel is almost 70% higher than that of a 10.3" barrel. Why is there more gas blow back when I shoot with a suppressor? Suppressors work by trapping gas pressure and slowing its release into the surrounding atmosphere. In the case of the AR-15, using the standard direct impingement gas system, this causes increased pressure within the gas system of the rifle and blow back for the shooter. Use our Suppressed Bolt Carrier in the Suppressed setting. Use a gas blocking charging handle such as the PRI Gas Buster, or Primary Weapons System Billet Charging Handle. Make a home made charging handle gasket with Silicone RTV sealant. Use less lubricating oil on your bolt/upper. This will keep the gun cleaner to begin with and produce less smoke and/or oil to blow back in the shooters face. Switch to a gas piston operating system (see below). Do your suppressors work with gas-piston type AR-15's? Yes, our suppressors will work with the gas-piston type AR-15's. However, as a general rule, gas-piston systems do not suppress as well as a direct-impingement operating system. The gas-piston system vents excess gas pressure right at the gas block of the weapon instead of directing it back into the action. While this keeps the weapons action cleaner and cooler, the trade off is that hot propellant gasses are now released into the atmosphere faster than if they were allowed to cool and expand in the action. Therefore the gun is not as quiet. You will have to decide if the trade-off is worth it to you. Can I use my suppressor with a .22LR conversion kit? Yes, our 5.56mm suppressors can be used on your AR-15 .22LR conversion kit. Can I use a 5.56mm suppressor on an AR Pistol? No. Most AR-15 pistols have a barrel shorter than 10.3" (see above for minimum barrel length requirements). What is an L.I.D. and do I need one? L.I.D. is an acronym for Gemtech's Linear Inertial Decoupler. Many suppressor manufacturers offer a similar device marketed under different names. They are also sometimes referred to as a Nielsen device. This is a bit of a misnomer as the L.I.D. operates differently than a true Nielsen device. The L.I.D. is used on handguns with a Browning-type action (Glock, HK, Sig, etc.) where the barrel must tip to unlock from the slide an cycle. These types of pistols are sensitive to additional weight on the end of the barrel (such as a suppressor) and must lift this additional weight to unlock the slide. The L.I.D. allows the weight of the suppressor to temporarily jump off the end of the barrel while the barrel unlocks, and then provides a small recoil impulse to assist the gun in cycling and loading the next round. If you are suppressing a Glock, HK*, S&W M&P, Sig, or Springfield XD handgun you will need an L.I.D. in your suppressor. Depending on the size and weight of the suppressor you may also need an L.I.D. for use on the Beretta M9/92FS. For other applications please contact Gemtech and we will let you know if you need the L.I.D. or not. L.I.D. 's should not be used for pistols with a fixed barrel such as the *HK P7, or on carbines with fixed barrels. This can damage the L.I.D. and suppressor. How does a suppressor mount to my handgun? Suppressors are mounted to pistols by using an extended, threaded barrel. In most cases, this requires that your factory barrel be replaced, unless your handgun came from the factory with an extended barrel already fitted. Heckler & Koch, Sig Sauer and Smith & Wesson currently sell centerfire handguns with factory threaded barrels. Visit their websites to learn more about which models are available in which calibers. Can my factory barrel be threaded? With the exception of some .22LR rimfire pistols, and the Beretta M9/92FS, the factory barrel cannot be threaded to accept a suppressor. A new, extended barrel will need to be purchased. Some manufacturers offer extended barrel that are threaded by them. Some will offer extended barrels that can be threaded by Gemtech, and some manufacturers do not offer extended barrels at all. Does Gemtech sell threaded barrels for pistols? Where can I get a threaded barrel for my pistol if it's one Gemtech doesn't sell? What pistol ammunition do you recommend for best performance? Can I shoot .22LR through my 9mm or other pistol suppressor? Yes, although the performance will be slightly less than that of a dedicated .22LR suppressor. A 9mm will provide decent suppression when used on a .22LR weapon. The .40 or .45 suppressor will provide even less suppression but may also work. What is a "wet" suppressor? The term "wet" refers to a suppressor that has had a small amount of liquid or grease introduced into the suppressor to improve performance. This is a common practice on .40 S&W and .45 ACP suppressors. A 9mm or .22LR suppressor can usually be fired wet or dry. The coolant is put into the first expansion chamber of the suppressor to cool the expanding gasses by way of evaporation. The coolant will last for 1-2 magazines before it must be replenished to regain performance. What should I use as media/ablative to "wet" my suppressor? Water is most effective, due to its high heat of vaporization, but it can run or evaporate out of the suppressor and can mix with residue in the suppressor to form acids that cause corrosion. Grease, while messier and less effective than water, can be left in the suppressor indefinitely without losing effectiveness. Petroleum based greases will tend to smoke quite a bit as well. Oil is often the easiest to apply from either a small bottle or aerosol can, but is the least effective and least preferable, as it runs like water while being messy like a grease, and leaves behind a fine mist of aerosolized oil after each shot. Water-based gels, such as wire-pulling lubricant gel, are a good compromise; they offer the efficacy of water with less mess, as they do not run or drip (but can still cause corrosion). However, they take longer to apply, as they must be cleared from the bore of the suppressor to ensure a clear path for the bullet (grease requires this step as well). Should you choose to use water, or water based ablative, you must thoroughly clean the suppressor and submerse it in something that will displace any traces of water that remain (such as WD-40 or Acetone). Do you have any QD pistol suppressors? We do not offer any quick detach pistol suppressors. Because many pistol suppressors require the use of an L.I.D. device, adding the additional length and weight of a QD type mount would make the suppressor longer, heavier, and more expensive. Do you offer the Multimount in other calibers? No. The MULTIMOUNT system is only available in 9mm. How do I mount a suppressor to my Walther P22? We offer a small thread adapter to convert the M8x.75 threads of the P22 barrel to the standard American thread of 1/2-28. This small adapter replaces the factory barrel nut that is covered by the slide. It has an extension to bring the threads out beyond the slide so that a suppressor can be quickly attached to the P22 without any gunsmithing required. This adapter will work with all models of the P22 except the P22CA (California model). How do I mount a suppressor to my Sig Mosquito? We offer an adapter the convert the M9x.75 threads of the factory threaded barrel to standard American 1/2-28 threads. No gunsmithing required. This adapter is for the Sig Mosquito with factory extended, threaded barrel only. How do I mount a suppressor to my GSG-5P or GSG-5PK? If you wish to mount a suppressor to the 16" barrel of the GSG-5 Rifle we can thread your factory barrel and install a small adapter with 1/2-28 threads. With the adapter installed, the factory mock suppressor can no longer be used. If you wish to register your GSG-5 Rifle as a Short Barrel Rifle (SBR) we can cut your existing barrel to the same length as the GSG-5P and use our 3-lug Navy style adapter. We offer a 3-lug Navy style adapter that threads directly into the front sight base of the GSG-5P. No gunsmithing required. The adapter offer the looks of a real MP-5 with a 3-lug interface as well as the tip of the 3-lug being threaded 1/2-28. We also offer a 3-lug Navy style adapter that threads directly onto the threaded barrel of the GSG-5PK. No gunsmithing required. The adapter offers the look of a real MP-5 with a 3-lug interface as well as the tip of the 3-lug being threaded 1/2-28. Be sure to specify exactly which model GSG-5 you have when ordering or speaking with our staff as the attachment methods of adapters varies by model. Is the Blackside-45 rated for .45 Super? No. The Blackside-45 is rated for .45 ACP only. It should not be used with higher pressure rounds such as the .45 Super. Is the Blackside-40 rated for 10mm? No. The Blackside-40 is rated for .40 S&W only. It should NOT be used with higher pressure rounds such as the 10mm Auto. Can the Blackside-40, Blackside-45, GM-9 or GM-45 be used on a pistol carbine? Yes, the Blackside-40, Blackside-45, GM-9 and GM-45 can be used on a pistol caliber carbine so long as the LID spring and piston have been removed and replaced with a fixed barrel thread mount adapter. Is the Blackside-40 or Blackside-45 rated for full-auto? No. The Blackside suppressor is not rated for use on full-auto weapons. For full-auto use we recommend our UMP suppressor in .40 S&W and .45 ACP, RAPTOR-40 for use on the MP5/40 or MP5/10, or our GM-45 for 9mm, 40S&W and 45ACP. Can a revolver be suppressed? No. Revolvers are not suitable for use with a suppressor because of the cylinder gap. The gap between the cylinder and barrel allows the propellant gasses to escape into the atmosphere there by rendering the suppressor ineffective. The only "common" exception to this is the model 1895 Russian Nagant revolvers with their sliding cylinder, which partially closes the gap of gas leakage as it is fired. They are also traditionally difficult to thread the barrels, as revolvers are not easily put into a lathe complete, and barrels may be difficult to pull from the receiver, or are part of the frame. Can I shoot Aguila Sniper SubSonic (SSS)? No. The Aguila Sniper SubSonic (SSS) uses a short casing and long, 60gr. bullet. It does not properly stabilize in the standard twist rate of most .22LR barrels. Unless you are utilizing a specialized barrel designed specifically for this ammunition, do not shoot it through your Gemtech suppressor. What .22LR ammunition do you recommend for best performance? Gemtech Subsonic, CCI Standard Velocity, CCI Green Tag, or CCI Subsonic. That said, part of the fun of rimfire suppressors is that you get to be the scientist. We encourage users to purchase a small amount of all different brands of ammunition in various loadings* and determine which particular ammo functions well with your gun, provides the best accuracy, and sounds the quietest to you. Different firearms and barrel lengths will do better with different ammo choices. * There are two specific ammunitions to avoid. First, Aguila SSS because its grain weight requires an uncommon twist rate barrel that most common firearms do not have, and second, shot shells or "snake shot" which can expand early and strike the inside of the suppressor, with potential danger and damage. Do not use this ammunition in your Gemtech suppressor. Is the Outback-IID rated for full-auto? Yes, within reason. Because the Outback-IID can be taken apart for cleaning it can be used for full-auto. However, without regular cleaning, the suppressor will become clogged with lead and it will no longer come apart. Make sure to follow the cleaning recommendations in the owner's manual. Can the Outback-IID be taken apart for cleaning? Yes, the D stands for Disassembly. Can I shoot .17HMR, .22 Mag, 5.7x28mm, or other calibers through my Outback-II? No. The Outback-II is designed for .22LR and lesser size and pressure calibers (.17M2) only. It is not rated for cartridges with higher pressures. Can I shoot shot shells (snake shot)? No. Shot shells will damage the internal components of the suppressor and should never be used. Can/Should a rimfire suppressor be shot "wet"? Rimfire suppressors can be shot wet, however there is usually little merit in doing so. The use of liquid tends to attract additional vaporized lead and unburnt powder to form a thick sludge in the suppressor that is difficult to clean out. The suppressor will stay much cleaner if shot dry. The current rimfire suppressors from Gemtech are optimized for reduced first round pop (FRP). Adding liquid to the suppressor will give very little, if any, increase in performance but will make cleaning them much more difficult. Which suppressors fit on an MP5? We offer three suppressors to fit the MP5. All three models are rated for full-auto use. Raptor-II: This is our workhorse SMG suppressor for the MP5. It is available with a fixed 3-lug QD mount. MK-9K: This is a larger suppressor favored by recreational sport shooters for its low, pleasing tone. It is available in several mounting options, to include the 3-lug QD for the MP5. Multimount: The Multimount suppressor is available with interchangeable mounts to adapt to a variety of weapons, including a 3-lug QD mount for the MP5. * For MP5 Navy barrel with threaded tip Gemtech can supply a smooth precision thread protector for proper alignment. Our suppressors will not fit over the normal knurled thread protector and should also not be used without a thread protector at all. The thread protector is necessary for proper alignment. No. The MULTIMOUNT is available in 9mm only. Does the MULTIMOUNT fit on a MAC? No. The Multimount does not fit on the original factory threading of the MAC, Ingram, Cobray submachine guns. The only suppressor for the factory original MAC coarse ACME thread is the Viper series. However, a Multimount can be used if you wish to thread the barrel tip and install an HK 3-lug type adapter. It does fit on the LAGE uppers that use the 1/2-28 threading. Does the Mossad-II fit the Micro Uzi? No. The Mossad-II will not fit the Micro Uzi (Uzi Pistol). It is designed to fit the full size or Mini Uzi only. What SMG's do you make suppressors for? Gemtech offers a number of suppressors for various modern SMG's. We do not offer any specific suppressors for historical SMG's such a Thompsons, Stens, or Grease Guns, etc. but some of our suppressors can be adapted to fit if you are willing to thread your barrel and/or install a quick detach adapter. Do you make a suppressor for the PS-90? Yes, our 5.56mm suppressors can also be used with the PS-90. We currently offer an adapter for the factory M12x1mmRH threads to use 1/2-28 muzzle devices. This will allow the use of 5.56 quickmounts or direct thread suppressors on the PS-90. The PS-90 will require registration as an SBR with the BATFE before mounting our suppressors. We recommend using the CMMG short barrel, which our mount will attach directly to without any additional adapters. This is necessary because removing the factory flash hider from the PS-90 reduces the overall length to less than 26 inches. Do you make a suppressor for the FN FiveSeveN Pistol? Yes, we offer the SAR-57 suppressor for use with the FN FiveSeveN handgun with the appropriate thread adapter. This will require the use of an extended, threaded barrel. Currently, Jarvis and EFK Firedragon are the only manufacturers offering barrels. Can I use the same suppressor on both the rifle and handgun? The SAR-57 can be used for both the PS-90 and FiveSeveN with appropriate adapters for both platforms. The G5/SHIELD are too heavy to allow the FiveSeveN handgun to function properly, and are recommended to only be used with the PS-90. Where can I get a threaded barrel for the FiveSeveN Pistol? Currently the only manufacturers of extended, threaded FiveSeven barrels are Jarvis and EFK Firedragon. By BATFE regulation, FN cannot import factory threaded barrels for sale to civilians. I want to register my PS-90 as a Short Barrel Rifle (SBR). How do I do it? This can be done by filing BATFE Form 5320.1 (Form 1) with the NFA Branch along with payment of the $200 manufacturing tax. Once approved, we recommend installing the CMMG short barrel in the PS-90. Where can I get a short barrel for my PS-90? Short barrels are available from CMMG, Inc. for use in the PS-90 once registered as an SBR. Can Gemtech cut and thread my factory PS-90 barrel? Yes, if you wish, Gemtech can also cut and thread your factory PS-90 barrel for use with our 5.56 suppressors. You will need to submit an approved copy of your Form 1 with the rifle before we will cut your barrel. Can I mount a suppressor to my PS-90 without registering it as an SBR? No. The PS-90's unique design requires the use of a long factory flash hider that is pinned in place to bring it up to legal length. Although the barrel is 16" without the factory flash hider, the overall length would be less than 26", thereby making it an SBR. We cannot mount our suppressors without removing the factory flash hider. Where can I get subsonic 5.7 x 28mm ammo? This may be difficult to find, but the model number is "SB-193", subsonic ammunition from FN that is in the correct grain weight. Please check with FNH USA for their advice before using ammunition that uses heavy grain projectiles meant for use in 5.56mm carbines. What is the barrel length of the TALON? The most recent TALON upper used a 7" barrel. They are not ported. There have been a few changes over the years on the TALON system. Older TALON units used a 5" barrel. There have also been several changes in rail systems over the years. What mount do I need to put a MULTIMOUNT/GM-9 onto the TALON? None. The TALON upper IS the mount. The barrel of the TALON has a threaded adapter plate that allows the large threaded opening on the rear of the MM9/GM-9 to screw directly onto the TALON upper without the use of any additional suppressor adapter mounts. Does the TALON include a bolt and charging handle? No. The TALON was originally designed as a direct replacement upper for clients already using the Colt 635 SMG. The clients reused their bolt and charging handle from the Colt 635. The TALON uses the Colt pattern and can use bolts made by Colt, Rock River Arms, and other manufacturers following the Colt standard. Can I have a barrel with 3-lug or other threads? No. The TALON system is available in one configuration only. We do not offer 3-lug barrels however, several TROSUSA offers short AR-15 9mm barrels with a 3-lug adapter on the end. If you wish to have a 3-lug type barrel we recommend assembling your own upper system. Can I have a different rail? No. The TALON system is available in one configuration only. If you wish to have a different rail system we recommend assembling your own upper for use with the MULTIMOUNT suppressor. What lowers will the TALON work with? The TALON will fit any mil-spec AR-15 or M16 lower receiver. Do you make a non-SBR version of the TALON? What ammunition should I use with my suppressor? For best performance you should only use factory loaded ammunition that meets military or SAAMI specifications. Only use ammunition that is properly designed for your particular firearm and barrel twist rate. Gemtech is not responsible for damage caused by the use of improperly loaded or defective hand loaded or reloaded ammunition. Can I use frangible ammo? No. Frangible or pre-fragmented ammo should never be used with a Gemtech suppressor. There is a risk that the bullet will come apart upon exiting the barrel and strike the internal components of the suppressor. Do I need to shoot subsonic rifle ammo with my suppressor? No. Subsonic ammunition is not required. In the case of .22LR or handgun suppressors, subsonic ammo will provide the best sound performance and there are many available subsonic loads. For centerfire rifle, while subsonic loads are available they are not required or recommended. Can I shoot subsonic rifle ammo with my suppressor? The use of subsonic centerfire rifle ammunition is AT YOUR OWN RISK. There are simply too many variables that affect the performance and stability of subsonic ammunition for us to warranty the suppressor when used with this ammunition. Gemtech is not responsible for damage to the suppressor or host weapon when used with subsonic ammo. What is the maximum velocity for ammunition to remain subsonic? The speed of sound varies based on temperature. As a general rule, ammunition should should be labeled with a velocity below 1,080 fps to stay subsonic. To calculate the speed of sound based for a given temperature use the online calculator HERE. As the temperature increases, so does the speed of sound. Can I shoot tracer ammo through my suppressor? No. Gemtech does not recommend the use of tracer ammunition with our suppressors. The tracing compound can cause damage to the suppressor. Do you have any loading data for subsonic loads? No. Gemtech does not provide data on subsonic loads to handloaders. Can I shoot different calibers through my suppressor than what it was made for? Your Gemtech suppressor was designed, tested, and intended to be used with a specific caliber. That caliber is stamped on the suppressor and listed in your Technical Manual included with your suppressor. We do not warranty or authorize you to shoot any other caliber through that suppressor. Any use of your suppressor with ammunition other than the caliber it was intended for is AT YOUR OWN RISK. Use of other calibers may result in damage or destruction of the host weapon and/or suppressor as well as injury or death to the shooter and/or bystanders. Any repairs made necessary by use of unauthorized calibers will be invoiced to the owner. Subcaliber usage is not encouraged, but smaller bullet size and lower chamber pressure may be acceptable. Larger bullet size than stamped on your model, or higher pressures are most certainly not encouraged and voids warranty. Can I order accessories and adapters directly from Gemtech? Yes! Accessories and Adapters can be ordered by anyone directly from Gemtech. Call our sales office at 833-350-9517 (Toll Free), to order from one of our friendly and knowledgeable sales staff. We currently accept Visa or MasterCard for part orders. We have an online store that you can order over the Internet 24 hours a day. Do I need a license to buy accessories? No. Accessories and adapters do not require a license to order. However, if you have an FFL please fax a copy to us for dealer pricing. Can I order replacement parts from Gemtech? No. Silencer parts are tightly controlled by the BATFE and individuals may not possess spare or replacement parts. Baffles, spacers, end caps, tubes, or other components deemed to be suppressor parts by BATFE cannot be sold to individuals or even other Class III dealers or Class II manufacturers. We can however, repair, replace, or upgrade every part of your suppressor except the serialized tube; but the suppressor must be sent in to Gemtech and damaged parts are destroyed in the process and not returned. Do I need to clean my suppressor? In general, suppressors require very little maintenance. We do not recommend cleaning the baffle stack of any of our centerfire suppressors. Although they may look dirty, the small amount of carbon buildup inside is both normal, and beneficial. It will actually make the suppressor slightly quieter. What does have merit is cleaning the mounting surfaces of the suppressor. We recommend cleaning the mount of suppressors with a quick disconnect feature or LID every 250-300 rounds. Disassemble the mount or LID, clean any carbon build-up from the components and lubricate with any high temp grease. This will keep the mount or LID functioning properly. The exterior surface of your suppressor should be maintained the same as any other firearm. Wipe with a light coat of gun oil to clean, restore, and protect the external finish of our suppressors. Blowing out the suppressor with compressed air will keep internal surfaces dry and also remove some unburned powder, carbon buildup, etc. What solvents should I use or avoid using for cleaning? Make certain that any solvent you choose is safe for the material your suppressor is made of. Avoid solvents that contain ammonia (Hoppes 9 and many bore cleaners) when cleaning aluminum suppressors. We also recommend against using water based cleaners in our suppressors. - Ed's Red (home made): Equal parts of Mineral Spirits, Acetone, Kerosene, and Automatic Transmission Fluid. If you wish to clean your suppressor you may submerge it in one of the solvents listed above. Soak it for 24-48 hours, remove and allow to drain. Once drained, blow the inside of the suppressor dry with compressed air. This cleaning can be helpful in the case of pistol suppressors that are fired "wet" to help remove any buildup of ablative grease, etc. Do any of your suppressors come apart for cleaning? Yes. The MK-9K and MULTIMOUNT suppressors can be partially disassembled for cleaning. The mount portion of the G5, G5-T, HVT-QD, QUICKSAND, and our LID units can also be disassembled for cleaning. Our Outback-IID, ALPINE, GM-22 and G5-22 .22LR suppressors as well as our GM-9 and GM-45 suppressors can be fully disassembled for cleaning. Can a suppressor be repaired? Yes, in many cases we can repair suppressors with minor damage, depending on which part has been damaged. The most common repairs for Gemtech are baffle or end cap strikes due to poor threading, ammunition issues, or improper installation. Because of our modular construction methods we can repair many of our suppressors individual components very quickly and at a very reasonable price. What is the process to send a suppressor in for repair? Suppressor owners may send their suppressors directly to the original manufacturer for repair or modifications. We will send them directly back to you when the work has been completed. There is no need to ship through a dealer or complete a Form 5 transfer. Please contact Gemtech directly prior to sending in items for repair. We will provide you with the shipping address and other requirements. Only send your items in a trackable manner (UPS, etc) where you can check with your shipper that they have arrived here. We also strongly encourage you to insure the shipment against loss or damage for the full replacement value. Can you rebuild your suppressors? Yes. Gemtech can rebuild the internal components of our suppressors should they become worn out. I have a suppressor model you no longer make. Do you still repair them? In most cases, yes. Gemtech maintains an inventory of repair parts for suppressor models that are no longer made. We can usually repair an item manufactured by us in the past. Please contact us if you have questions regarding the repair of one of our older models. I have a suppressor made by someone else. Can you repair of modify it to your specs? No. Gemtech does not perform work on suppressors that were not made by us. Please contact the original manufacturer of the suppressor for repairs. How do I send a barrel to Gemtech for threading? Ship the barrel, or barreled action/upper to Gemtech via a trackable means such as UPS or FedEx so you will know when it arrives here without having to call us to check. Insure the package against loss or damage while in transport to us. I have a suppressor made by someone else. Can you repair of modify it? Does Gemtech still offer rebuild/upgrades for old MAC suppressors? No. Gemtech no longer performs this service. I don't see quite what I'm looking for. Does Gemtech make custom suppressors? No. While Gemtech earned a reputation for innovative custom suppressor designs, we have simply run out of time to build custom suppressors due to the production demands of our normal catalog items. If you are a military or government client looking for a specialized suppressor please contact Gemtech to discuss your requirements. Does Gemtech offer custom thread adapters? I want one of your older model suppressors not listed in your current catalog. Can I get one? Maybe. Items that are no longer listed in the catalog are rarely available. However, in some cases we have made special arrangements with a distributor to carry that item on an exclusive basis, or we have some old stock, demo, or blem units available. You are always welcome to call us and ask. But if we don't have old stock, demos, blems, or an arrangement for an exclusive run for a distributor, we probably won't be making any more unless we see significant demand. Sorry. What are the barrel thread dimensions for your suppressors? Will Gemtech register my receiver as an SBR when cutting my barrel? No. Gemtech does not register receivers as SBR's for dealers or individuals. You are responsible for registering your receiver with the BATFE via Form 1 (individual) or Form 2 (manufacturer). Once your form is approved, you may send your SBR firearm and copy of the approved form to Gemtech for us to cut/thread/recrown to your length specifications. Does Gemtech offer any general gunsmithing services such as trigger jobs, stock bedding, etc.? No. Gemtech is not a gunsmithing service. Beyond threading barrels, and some minor disassembly of firearms to accommodate threading, we do not offer any additional services such as trigger work, repair of firearms, refinishing services, etc.